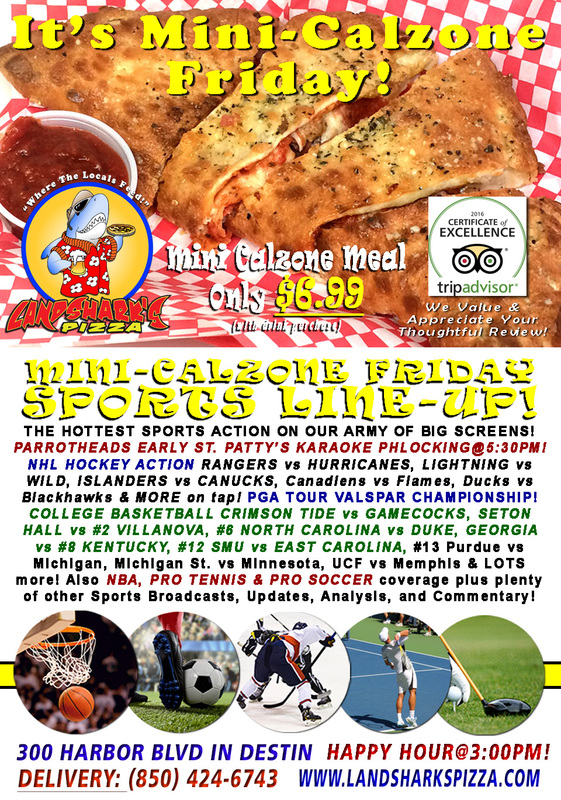 / Best Calzone in Destin FL / Phreedom Phriday, PARROTHEADS & ST. PATTY’S Style KARAOKE! $6.99 Mega-Mini Calzone, THE SINGIN’ STARTS@5:30! Phreedom Phriday, PARROTHEADS & ST. PATTY’S Style KARAOKE! $6.99 Mega-Mini Calzone, THE SINGIN’ STARTS@5:30! We’ve won the weekday war and arrived in the Land of Weekend! Time for a Delicious, Brick Oven-Fired Landshark’s Calzone with not just one but TWO choice toppings, dine-in til 5pm only $6.99 – BELLY BUSTER of a deal! THE LANDSHARK’S DRINK OF THE DAY – $1 OFF our Landshark’s ‘JESTER MARGARITAS’! PARROTHEADS A-PHLOCKING@5:30 FOR A ST. PATRICK’S DAY GOOD TIME ONE WEEK EARLY – President, Mike Whitley has made a proclamation!!! 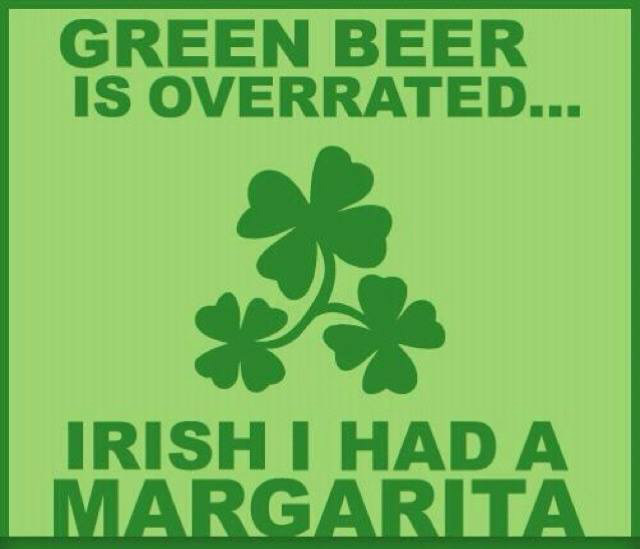 The ECPHC will celebrate St Patricks Day on March 10th!!! He may have had a little too much Irish Cheer. Anyway…This proclamation gives everyone permission to wear the green and to kiss the blarney stone! Our phriend Tim Morinelli will be the Karaoke DJ as we will be testing our on vocal abilites with a parrothead version of the Voice. 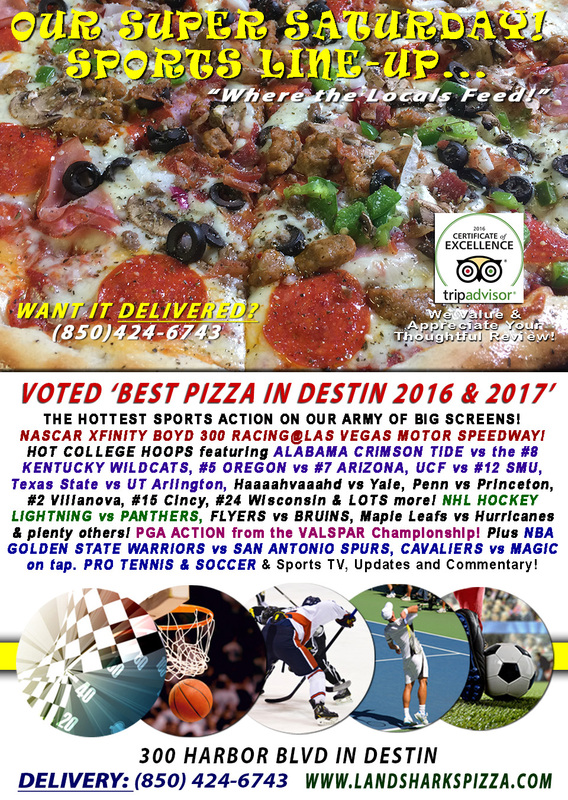 SPORTS ON OUR ARMY OF BIG SCREENS – CRIMSON TIDE vs GAMECOCKS, #2 VILLANOVA vs SETON HALL, #6 NORTH CAROLINA vs DUKE, #8 KENTUCKY vs GEORGIA, #12 SMU vs EAST CAROLINA, #13 Purdue vs Michigan, Michigan St. vs Minnesota, UCF vs Memphis, Davidson vs Dayton & LOTS more! PGA TOUR action VALSPAR CHAMPIONSHIP! NHL HOCKEY with RANGERS vs HURRICANES, LIGHTNING vs WILD, ISLANDERS vs CANUCKS, Canadiens vs Flames, Ducks vs Blackhawks & more on tap! NBA HOOPS featuring WARRIORS vs TIMBERWOLVES, ROCKETS vs BULLS, CELTICS vs NUGGETS, Hawks vs Raptors, Kings vs Wizards & more! Also PRO TENNIS & PRO SOCCER coverage plus plenty of other Sports Broadcasts, Sporting News, Analysis, and Commentary! Pro Tennis This Week: ATP & WTA BNP Paribas Open at Indian Wells! PGA Tour Golf This Week: Valspar Championship from Innisbrook. NASCAR This Week: (Saturday March 11) Boyd Gaming 300 XFINITY Series Racing(Sunday March 12) Kobalt 400 Monster Energy Series Racing at Las Vegas Motor Speedway. 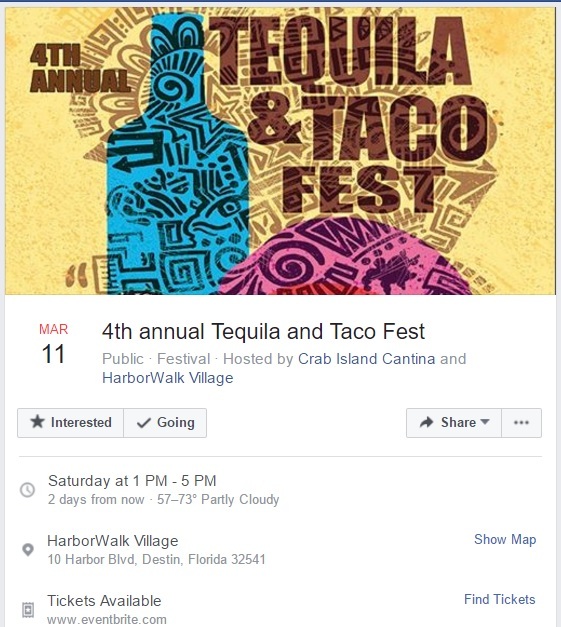 Previous Post: « Landshark’s Will See You at the Taco & Tequila Fest this Saturday@Harborwalk Village!